Products Steel column radiators "TO BE"
A timeless look, a shape elegant and harmonious, which offers great versatility in both classic and modern settings. • A wide range of models: from 2 to 6 columns with a wide range of heights from 300 to 3000 mm and a number of elements from 3 to 40, which allow great flexibility in dimensions (see technical tables of the models). • On request it is possible to have sizes not described in the tables. • Absence of sharp edges and rounded shape reduce to minimum the risk of accidents, while accessible surfaces make easier the cleaning. • These characteristics make radiator TO-BE particularly suitable for environments where particular safety and sanitary regulations must be respected (as in hospitals, schools and public places). The wide heating surface and large volume water assure a very high heat output. 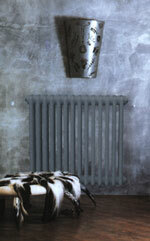 These characteristics make also possible the insertion of this radiator in low temperature heating installations.